Channel Inlay is the Art of setting Cut Stone separated by thin borders of metal (Sterling Silver in our pieces). 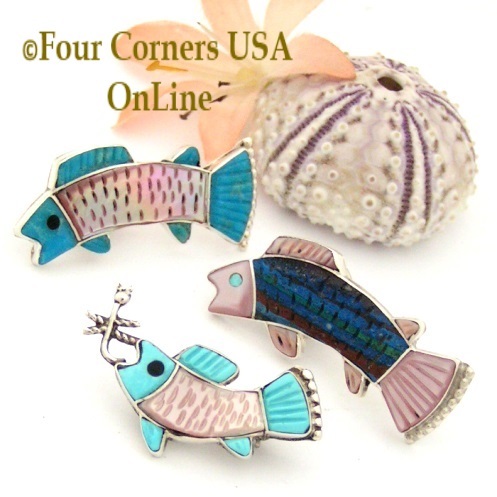 These Fish Brooches and Lapel Pins showcase a rudimentary example of Channel Inlay it is very easy to see the 'Channels' of silver separating the stones yet this Zuni Artist adds a bit of Intarsia in the eyes. 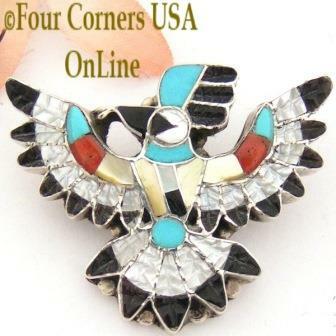 Although Zuni have been traditionally known for Intarsia style Inlay, contemporary Zuni and Navajo Jewelry Artists have crossed all boundaries with both affiliations offering incredible workmanship in both techniques and often almost always combining them. In the complex Pin Pendant you can witness various cut stones (and shell) creating an image of the Thunderbird. Not only did the Artist use many small cuts of stone but also textured each to bring depth for the feathers. Although most all of this piece utilizes the Channel Inlay technique, you can see in the face and along the top of the wing (turquoise, coral, yellow mother of pearl) where Intarsia has also been incorporated. Intarsia Inlay is the Jewelry Making technique of cutting stones to fit precisely against each other. 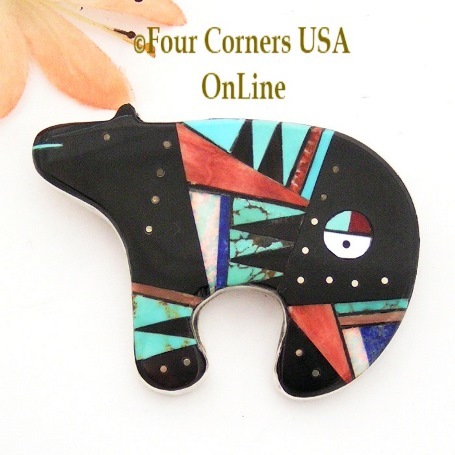 This form of Inlay can be rather tricky and less forgiving than Channel Inlay as the pieces must fit snug against each other as witnessed in this exquisite Bear Pin Pendant Combo by Zuni Artisan Germaine Smith. 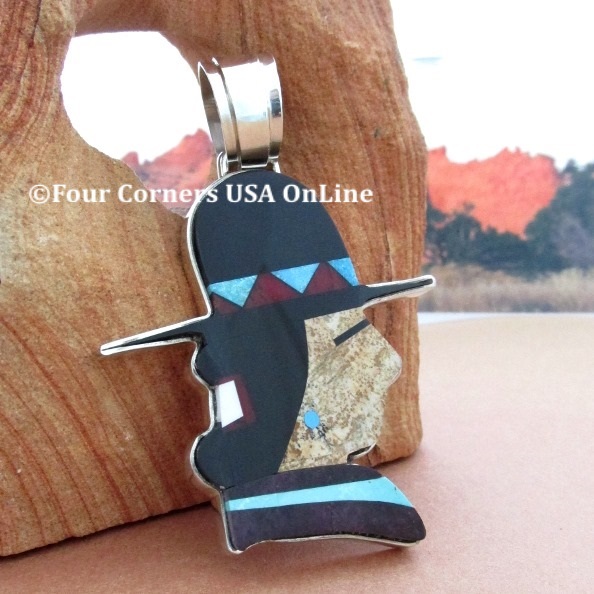 ​Here is a wonderful example of Contemporary Navajo Jewelry Making sporting intricate Channel and Intarsia Inlay Techniques in modernized designs departing from traditional cultural symbols which truly exemplifies Native Americans as some of the finest jewelers in the world. 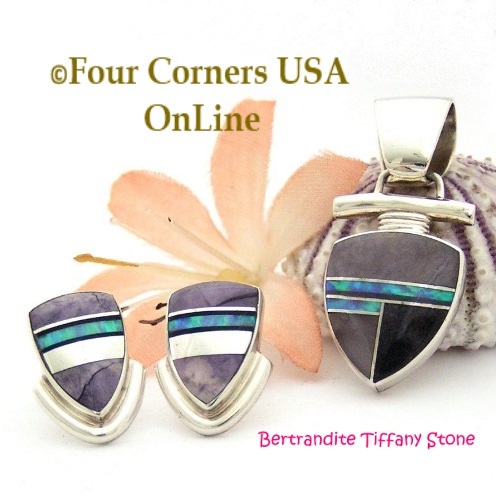 This Bertrandite Tiffany Stone Fire Opal Fine Inlay Pendant Post Earrings Set by Albert Francisco and Shiela Tso beautifully incorporates Channel and Intarsia Jewelry Techniques. An exquisite male profile that portrays a story of daily life and challenges. This is truly an extraordinary example of stone against stone Inlay Jewelry Art. Mr. Desson named this piece 'Billy Jack' perhaps associating with the movie character of the 1960/70's. Stones are meticulously cut so precise one might assume it was painted. The Silver work completes this wonderful Folk Art Pendant with straight edge outline and large dimensional bail.